If you are looking for a local reliable Electrician in Leeds for your home or business I believe I can help. My name’s Matt Fletcher, I own & manage Fletcher Electric Ltd, a small Electrical Contractors based in Meanwood, Leeds. My aim is to provide a top quality service for my clients, with a strong emphasis on customer satisfaction. I am always trying to build on my strong reputation which is proven by many past customer reviews on various third party websites. 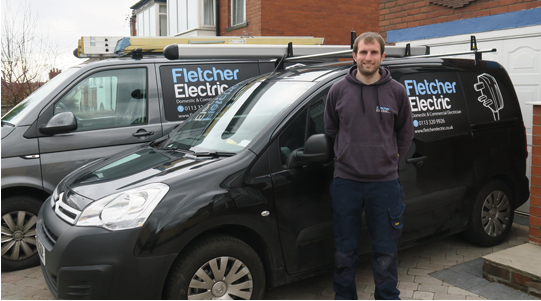 Fletcher Electric are one of very few Electricians in Leeds to be vetted and endorsed by Which? consumer magazine as a ‘trusted trader’. You can view our profile and read customer reviews here. Full scope member of the Electrical Contractors Association & Domestic Installer Part P scheme ELECSA. Both Commercial & Domestic jobs are inspected annually for quality & compliance. Approved by the Government run 'Trust Mark' is the only endorsed scheme for almost all trades in and around the home. We undergo vetting and on-site inspections to ensure the firm is compliant to industry standards. To maintain a high level of customer service I specialise in working in North Leeds & The City Centre alone. Unlike other Electrical firms who claim to cover the whole of Leeds, or even West Yorkshire, it is my belief that by being local to our customer base and concentrating on one key area I can offer the best possible service. Smaller domestic work account for a large proportion of our workload and any size job is as important to me as it is to you. I provide the same high level of service for smaller jobs as I do for larger clients. If you’re not sure if its something I would do then please call or email me, I am always happy to offer free advice or a quote even if no further paid service is required. View more information on domestic electrical work.